When the DSM Console Server is equipped with the Dual GigE option, this allows the DSM to be connected to both a primary network and a secondary network. If an unresponsive network element disrupts communication via the primary network, remote administrators can then establish an out-of-band connection via the secondary network in order to revive malfunctioning devices and restore the primary network without the delays and hassles of a service call. In large scale network applications, an out-of-band management solution can save both time and trouble by providing an alternative avenue for dealing with unresponsive devices at remote equipment sites during communication outages. Although an out-of-band management solution generally provides the best means for dealing with unresponsive devices that disrupt communication with remote equipment installations, it's important to remember that an out-of-band management solution is only as strong as its weakest link. If your out-of-band implementation includes only one in-band and one out-of-band channel for communication with remote devices, there's still a chance both avenues for access to the remote site might be down at the same time. A DSM Console Server equipped with the Dual GigE option improves the reliability of your out-of-band access solution in several ways. The presence of the secondary Gigabit Ethernet port means that both in-band access and out-of-band access are network based, providing an immense improvement over standard dial-up communication. 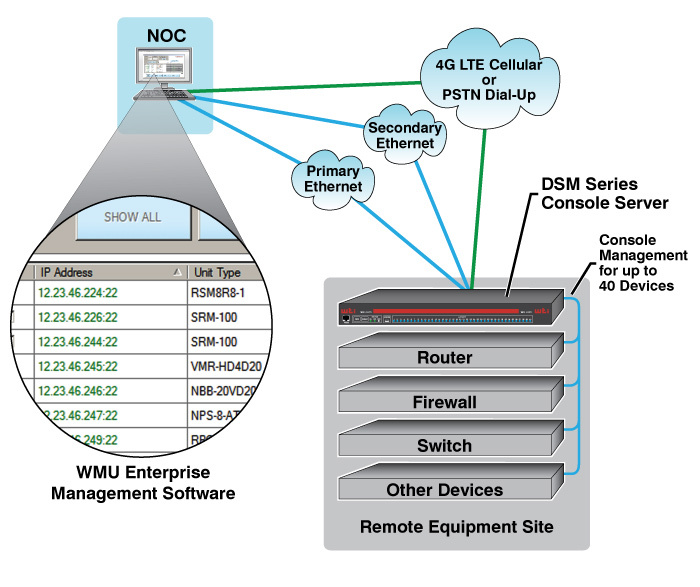 In addition, the DSM's Dual GigE Option can also be combined with either the DSM's 4G LTE Cellular option or the onboard dial-up modem option, to provide a third avenue for redundant access to console port command functions on critical remote devices.